There's a common misconception with many small businesses that social media marketing is this huge undertaking that will consume tons of time. That's simply not the case. Social media, if done correctly, is managed and focused on at levels that are convenient and effective for you. Sure, you'll have comments that come in (hopefully) that you need to respond to. 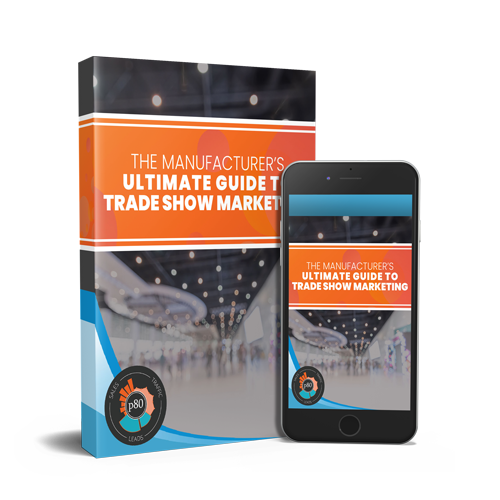 You may want to jump on some of your clients' or leads' pages to interact a bit, but overall social media marketing is not the time sink everyone NOT already involved thinks it is. Small businesses are busy little bees. While trying to grow the business and work in the business, they are also reacting to tons of "fires", requests, and distractions. This is one of the biggest reasons social media marketing gets pushed to the side. When a small business owner starts prioritizing what they need to handle on a minute by minute basis, social media's rank on the importance scale tends to keep plummeting. It loses priority for a couple of common reasons. The first reason is most small business owners know how to use Facebook personally, but haven't the slightest clue where to start for their company page. Most of the small businesses we work with have no other social presence. No Twitter, no Google+, sometimes no LinkedIN. They tend to have Facebook pages, because they are mostly comfortable with Facebook. This all comes down to learning curve. When deciding whether to learn a new way to save money on their taxes or learn how to manage a Twitter account, most small business owners that we work with will go for the tax savings. They just don't "get" the value that can come from a solid social media strategy. The second biggest hurdle to continual use of social media by small businesses is the need to come with content to post. When/if a small business owner comes up with 5 minutes to interact on social media, they struggle to come up with something "good" to share. Therefore, they don't share anything. They may be between a sales meeting and an employee misconduct meeting. Their head's are elsewhere. They aren't in the right state of mind to effectively communicate in social channels. As mentioned above, when you have 5 minutes to post something on one of your social channels, you tend to be in the wrong frame of mind to make it effective. For that reason, we recommend having a staff meeting to brainstorm social post ideas and then scheduling the posts to be published over a period of time. One of the biggest benefits to doing this is that you will have multiple perspectives in the room, all focused on the task of creating as many high-quality social media posts as possible. When you've come up with a good list, look through the list and see how many posts can be duplicated and written a little differently. It's amazing how much more mileage you can get from a single social status update by simply rewording it and sharing it again. You have to realize that most of the social posts that you share as a small business will not be seen, at first. As you build a following, that will no longer be the case. You can also look back at older social media updates you've shared and reshare them. So the question then becomes, how do you schedule out your social media posts in advance? As with anything technology relate, there's more than one way to do it. 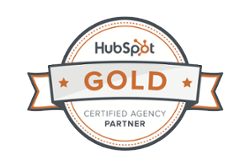 We recommend using either HootSuite or Buffer. This post will focus on HootSuite. Assuming you've created a FREE HootSuite account and added some of your social networks to it, you are now ready to schedule out social media posts. There are a couple ways to do it. I'll cover both here. When you click in the 'Compose Message' box in the top-left corner of HootSuite you will see a list of the social media accounts you have setup to use in HootSuite. Simply click each social network that you'd like your status update to appear in. If you will most frequently be using the same accounts, click on the thumbtack to the right of the name and star to keep those networks selected. Notice above that the 3 accounts I highlighted are tacked so that they are selected by default when I compose a message. Next, you need to write the social media post you want to schedule to be published. If you had a brainstorming session like I recommended above, you can probably copy and paste the status update into the compose window. If you are including a link in the status update, you should put the cursor in your message where you want the link to appear, then paste the link into the 'Add a link...' below the message and click the 'Shrink' button. This will convert your long URL into a shortened one. This saves you precious character space for social networks like Twitter. Now all we have to do is set a date and time in the future for the status update to be published! Start by clicking the calendar icon to the right of the 'Add a link...' box. That icon will open up a simple calendar and time box to schedule the status update. 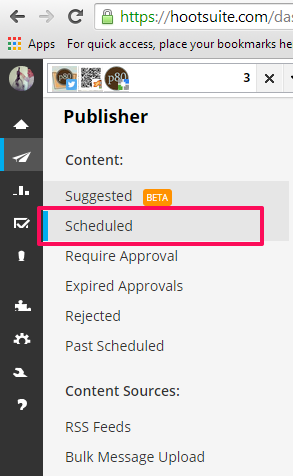 You will notice that there is an 'AutoSchedule' option at the top of the scheduling window. Please feel free to experiment with that option as you'd like. We'd recommend using it for some of your posts and hard-scheduling some of your other posts, then comparing which posts get more activity. If it proves to be a wash, I'd stick to scheduling your posts by hand to ensure you are being consistently active. 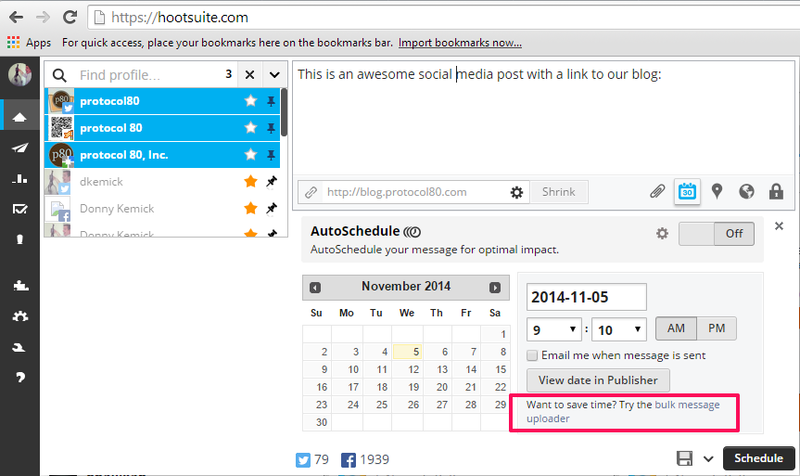 To hard-schedule the post to be published at a future date/time, simply use the calendar to pick a date. After you pick a date, use the time boxes to set a time. 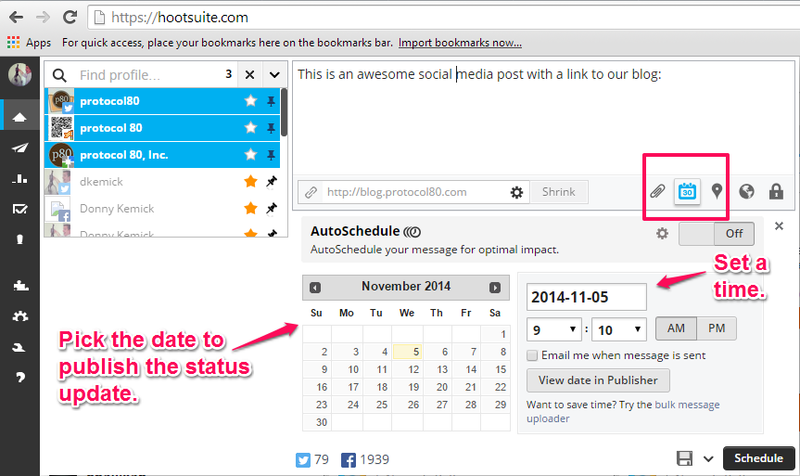 You can optionally be notified by email when the status update gets published. From experience, I would suggest leaving this unchecked. We fight with enough emails during the day... Now, click the the 'Schedule' button in the bottom-right corner and this message will be scheduled to send at the date and time you selected. By scheduling your posts, you can regularly share content in social media without having to regularly visit each social site. You do however have to have a regular brainstorming discussion to refill the schedule though! If you are the observant type, you may have noticed the 'Want to save time? Try the bulk message uploader' in the image above, just below the 'View date in Publisher' button. Let's take a look at that option now. Much like the hand-scheduled posts above, the bulk uploader lets you select one or more social networks to apply the bulk updates to. Simply click on the social networks you want to be updated with the posts you will upload and you're good to move on. This is probably a 1st time only step, meaning after you've done this process once, you probably won't need to do it on subsequent bulk uploads. 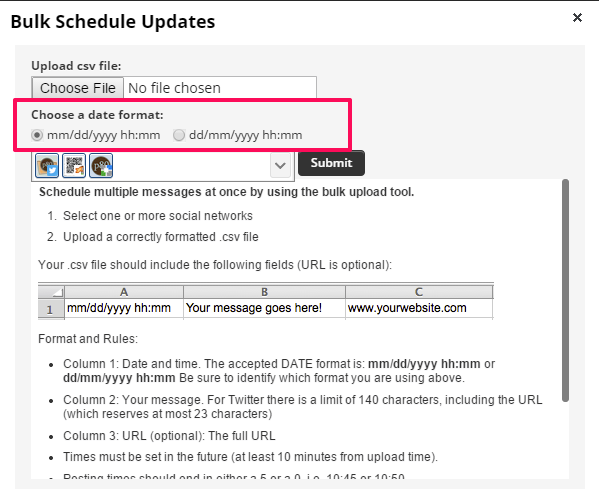 It is important however to understand the bulk upload format before trying to upload bulk, scheduled posts. It's really important that you use the correct date/time format that you selected in step 2 above. If you chose 'mm/dd/yyyy hh:mm', that field in your csv file would look like this for a date and time of December 12th, 2014 at 2:15pm: 12/12/2014 14:15. All times MUST end in either a zero or five. No times like 10:32. It would have to be 10:30 or 10:35. 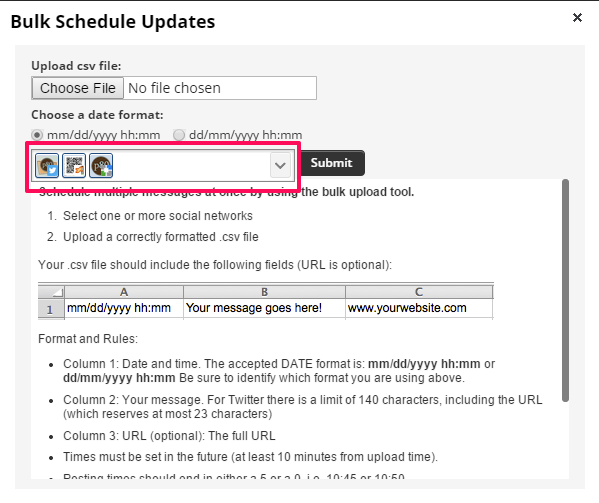 All times must be at least 10 minutes in the future to allow for Hootsuite to upload and process your bulk upload. Again, this is probably a 1st time only step, meaning after you've done this process once, you probably won't need to do it on subsequent bulk uploads. 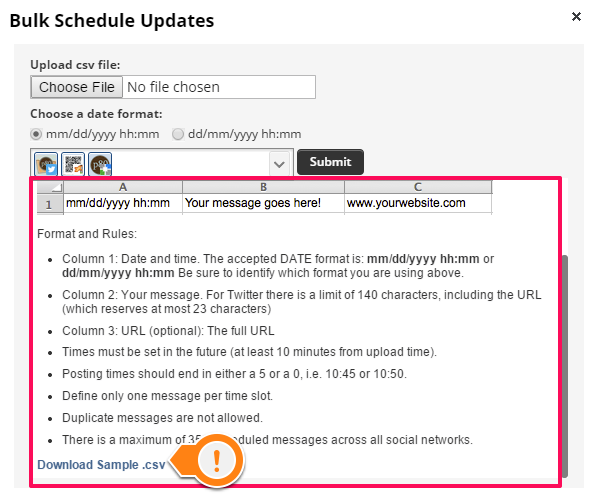 It is important however to understand the bulk upload format before trying to upload bulk, scheduled posts. At the bottom of the Format and Rules section there is a small blue link labeled 'Download Sample .csv'. Go ahead and click that link to download the sample file. Save it to your desktop or anywhere else on your computer that you can easily find it. If you were to open the sample data CSV you just downloaded in Notepad or a simple text editor, you'd see the sample data in this format. The default program to open a CSV file should be Microsoft Excel, Google Sheets or Open Office Calc. The last 2 options I listed are FREE. Most people have Excel already so I will use that in this example. If for some reason your computer doesn't use one of those programs to open the sample CSV file by default. Open the program you want to use and then open the sample CSV manually under the File > Open menu. Notice that the data starts in row 1. There is no header row. The file needs to stay that way. Don't add the header! Also notice that in the first column, the time format is in military time. In row 2, the date is 11/22/2016 13:30. There are many sites online that will do regular to 24-hour time format calculations for you, but you can also just remember to add 12 to the PM hour it is (e.g., 2pm = 2+12 = 14) to get the 24-hour, military format. Also notice that the 2nd column contains NO URLs!! URLs should all be placed in the 3rd column. If your status update references a blog post on your site, put the link in the 3rd column and the test in the 2nd. If Twitter is one of the social networks you selected, be sure to keep your 2nd column content under 117 characters if you include a URL to accommodate the length of the appended, shortened URL. I would suggest starting with this sample file and simply overwriting the values with your own. When you are finished entering all of the posts to schedule, you can re-save the CSV file with a new name that references the time frame you are posting to and possibly the topic. For example, something like seo_posts_11_3_through_12_31_2014.csv. IMPORTANT - be sure that you are saving your file in CSV format, and not the standard XLSX, Excel format. Finally! You should now have a CSV file ready to use in the bulk uploader tool. 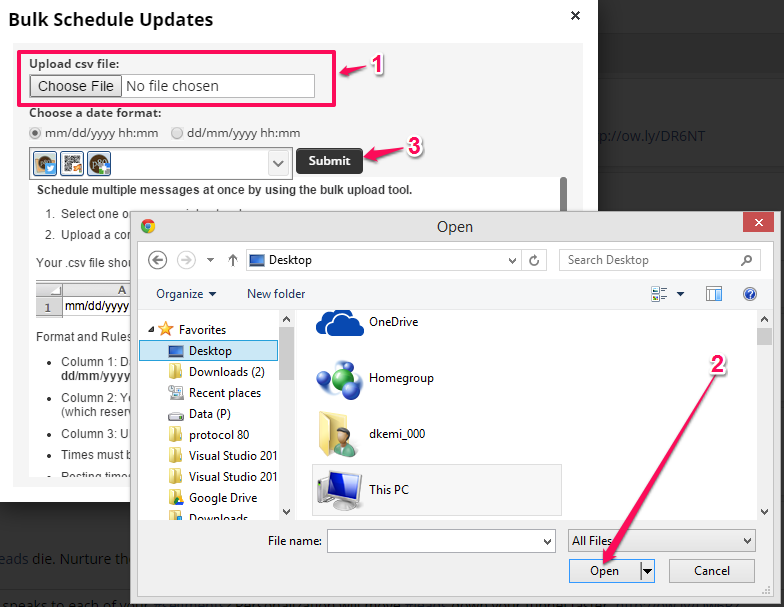 Now, go back to the top of the Bulk Upload window and click the 'Choose File' button. This button will open an 'Open Dialog Window' that lets you browse your computer to select your CSV. When you find it, click the Open button or Enter. All that's left now is to click that lovely 'Submit' button! 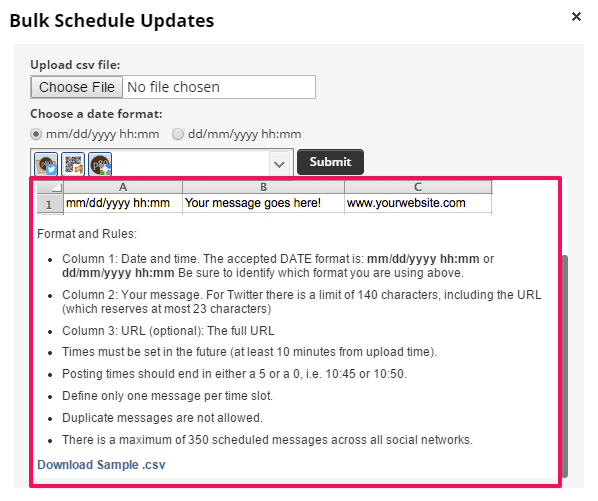 When you click 'Submit', Hootsuite will evaluate your CSV for any mistakes and let you know if they find any. If they do, simple correct the mistakes in Excel and try the bulk upload process again. 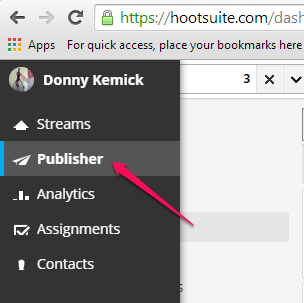 If your file is good to go, Hootsuite will schedule all of your posts for you! Having second thoughts on one of your scheduled posts? No problem, you can view a list of all of your scheduled updates and modify/delete them as you'd like. 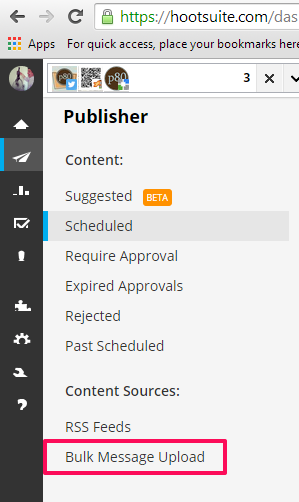 Just go to the left nav option for Publisher and select the 'Scheduled' sub item. Doing so will show you a list of all of your upcoming posts. To the right of each post you will see an option to edit the scheduled post. If you wait till you have time to be active in social media, you will be retired when that happens. Instead, schedule a staff meeting once per month where you brainstorm social media posts to schedule in advance. It will help you appear active in the social channels and also help your SEO.